Today was our third day on the ground, and we spent it in Bethlehem. Getting from Jerusalem to Bethlehem is a process, as it always is when one is trying to get from Israel to Palestine and vice versa. In 2004, the Israeli government began building a wall around Palestine for security reasons, making the commute between the two regions lengthy and cumbersome. We walked along the wall on the Palestinian side after making it through the Bethlehem checkpoint. 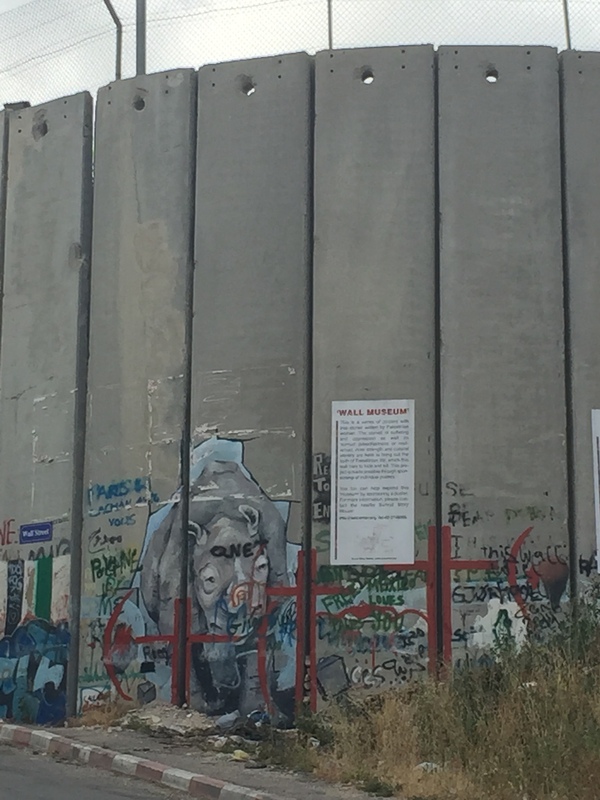 The wall was decorated with beautiful and uplifting graffiti that won’t be found on the Israeli side of the wall. We spent the day at Aida refugee camp. Aida refugee camp was established by the UN in 1950. Aida is unique because it’s a refugee camp in Bethlehem, which is in Palestine, for Palestinians. This means that the Arabs living there are refugees in their own country, which is a difficult idea to wrestle with, for a number of reasons. We spent the morning with Mohammad ‘Musa’ Al-Alazza, a 25 year old Palestinian filmmaker whose mission is to document and accurately report the injustice taking place everyday in Palestine. Two years ago, Musa suffered a rubber-bullet gunshot wound below his right eye, requiring three surgeries and one trip to the States to repair. Despite the surgeries, he suffered permanent damage to his right eye. You can read a bit more about Musa’s story here. The conflict between Israel and Palestine goes beyond the right to land. When someone lives under constant surveillance, countless other things are taken as well. How can you live normally as a refugee? All of your potential experiences are taken from you before they have a chance to happen. Beautiful moments can’t happen under such oppression. Falling in love, discovering a passion, developing a skill, cultivating relationships, etc. are all compromised as a result of the occupation here in Palestine. It’s hard to be a witness to such oppression because there comes a point when you no longer know how to react to what you’re seeing. This evening as a group we discussed the concept of home and what home means to each of us. For me, home is a really interesting idea because everyone has a unique definition. I think home is where you belong. For a lot of us, finding where you belong is a hard thing because you can’t really know whether or not you belong somewhere until you venture there., For Palestinians it’s different; they know where they belong, but they aren’t allowed to belong there. It is my personal belief that the tension in Israel and Palestine will remain in place until Palestinians are brought home. Abbie Rastatter just finished her freshman year at the University of Colorado Boulder where she studies computer science. She constantly craves impactful encounters, but spends way too much time shopping for jewelry. 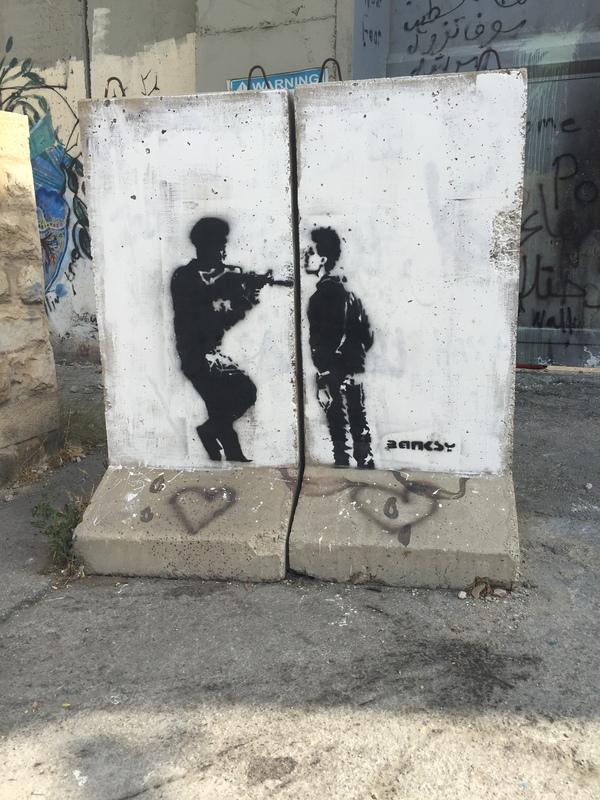 This entry was posted in Region 7 Trip and tagged Holy Land, Palestine, Peace not Walls by pnw2014. Bookmark the permalink.